Five years later, one Academy Awards like Los Angeles presser, hidden economic agendas, a defamation lawsuit, a two-month prison stay, rhetoric over Olympic Style drug testing, the most expensive Pay Per View and botched ticket distribution—The Wait is Over! “It took a while, but I have been calling and asking for this fight for a long time,” said Mayweather during the lone press conference to launch the promotion. Floyd ‘Money’ Mayweather, 47-0 (26 KOs) will finally meet Manny Pacquiao, 57 (38 KOs)- 5 (3 KOs)-2 draws, in an epic welterweight boxing confrontation that will shatter all financial barriers associated with the sport on Saturday May 2 at the MGM Grand Garden Arena in Las Vegas. Mayweather is 38 years old and Pacquiao is 36. Mayweather is the richest athlete on the planet and Pacquiao is the revered Congressman from the Philippines. One is in love with money and the other desperately needs the money that this fight will generate. Most fans and many of them Black want to see Pacquiao knock Mayweather out and off his lofty pompous perch as the best pound for pound boxer in the world. Mayweather has relished the animosity leveled against him, humbled by a domestic violence conviction against the mother of his two children that interrupted his cha-cha with his date with destiny and landed him in prison for two months. 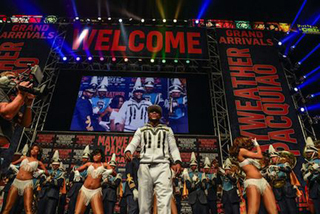 For the better part of his 19 years as the sport’s gleaming star, Mayweather has been the economic engine that stirs the drink of controversy within and without of the sport of boxing. His quest to retire undefeated and a multi millionaire status never achieved by the likes of Joe Louis, Muhammad Ai, Joe Frazier, Mike Tyson, Sugar Ray Robinson, Sugar Ray Leonard or any one else serves as a defiant driving motivation. However, regardless of the outcome of the career defining moment his legacy will near wits end, with one fight left on the most lucrative contract ($200 million) ever awarded a boxer. Against the one guy that many felt he was avoiding, Mayweather will likely earn the amount of his entire Showtime/CBS contract on Saturday evening. The significant question is, will the fans and pundits who have been clamoring for this bout get what they want? Will it be worth $100K ringside ticket? Will it award the casual observer who pays roughly $100 for the Pay Per View? Will this fight save or ruin boxing? “I don’t have nothing to prove. I know about my skills and I know what I can do. I was born into the sport of boxing and I am fully blessed,” he added. That he was born to a prize fighting father who served five years in prison for dealing drugs and to a mother who suffered from substance abuse are the compelling story lines that are lost in his evolution to the height of the sports and entertainment stratosphere. Boxing is a sport that is flush with men who climb from the abyss to live a life of promise, but rarely do most of them sustain it. Unlike Mike Tyson and scores of others before him, Mayweather has surrounded himself with astute advisors such as Al Haymon who has protected him from those outside termites who best erode the riches and royalty of a fighter. He recently gave each member of his massive entourage a note explaining that the train was coming to the end of the station, meaning that many of them will have to find employment elsewhere soon. Among them is his Olympic teammate Nate Jones who had fell on lean times after his boxing career failed and led him to a life of drug peddling and crime. 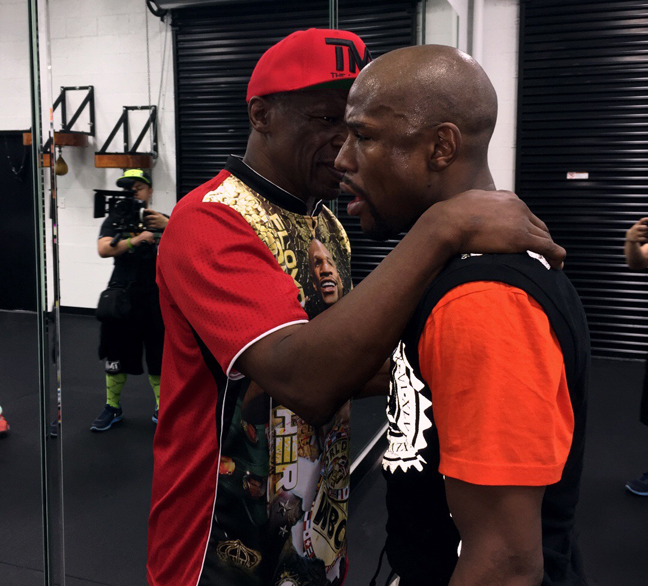 Today, Jones is one of Mayweather’s most trusted and responsible employees. He trains fighters and as Mayweather himself has said will always be alright. For Mayweather it has always been about trust, loyalty and family. Hence the lead promoter is Mayweather Promotions own Leonard Ellerbe, a confidant and friend who put his life on the line for Mayweather, literally. There is the reunion with his father Floyd Sr. who taught his son everything he knows, the uncle Roger who perfected it while the dad was in the joint, the grandmother who raised him, the mother who birth him and his kids who inspire him. 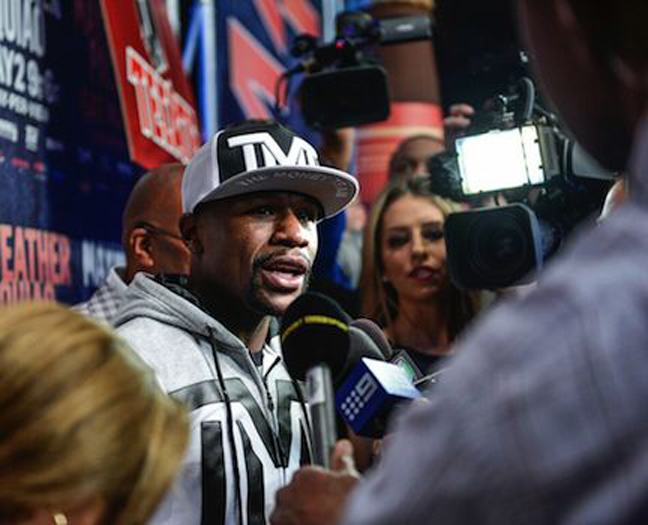 Quietly, Mayweather is not who is projected in the media. The fancy cars that he rarely drives, the flamboyant, money flaunting arrogant athlete you assume. 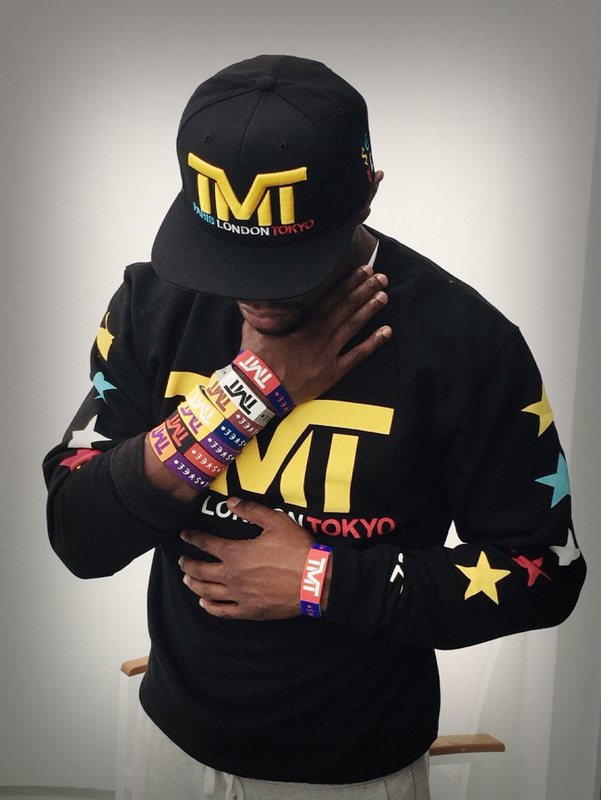 For some a career in sport is a relief from life, for Mayweather sport provides him the relief in life. This is a man who retired at the height of his prime shedding tears. His fear is not that of losing a fight. His fear is that of not caring for his family. He fights to protect that.